The car you see in the picture is a 2009 Pontiac Solstice. That in itself does not make it a hot rod. Not even by a long shot. However, this past winter in Florida it became just that. Here’s the story. A friend of mine spends his winters in sunny Florida with the love of his life and a wonderful lady. They decided on a whim to head over to the Mecum auction to look at people and cars. So, in the middle of this chaos my friend wandered over to look at this cool hard top. Great lines, two seater, body is straight and it looked pretty sleek. But, we all know the engines were pretty weak and overall not all that swift by today’s standards. Then it happened. The clam shell hood was opened and Jack stuck his head in to see the engine. This is the point when he went cold inside. There under that hood was a LS3 Corvette engine! A 490 horsepower monster stuffed under the hood of a Pontiac Solstice! So, before Jack knew what happened he began bidding on the car. And, like most auctions before you catch your breath you find out you were the top bidder. Sure enough he bid and bought this rocket. Within twenty minutes the money was exchanged, the insurance was written up and a car hauler all on site hand this deal wrapped up. It happened so fast he felt like he was in a time tunnel. So, within a couple of days the car was shipped back north to his home. Later, when winter started to turn to spring he and his love came home. He told me about the car at the first cruise of the year. When he opened the hood I could not believe somebody had the courage to wedge this monster Corvette engine in a twenty nine hundred pound car. It seemed impossible but there it was right in front of my beak. So, now fast forward about two months and Jack takes this unassuming Solstice of all things to a local car show. Myself with many of his friends lined up our chairs just to watch people look at the car. Almost everyone of them did a slow walk by of the car to be polite. Jack does not have a sign or a poster board for the car. He just parked it along with all the others. So, we watched as the spectators walked up to the car, looked at it with boredom and started to walk away. As they strode away most looked down into the engine compartment out of curiosity. Then, the immediate head snap. Double takes, triple takes, and pointing. Utter astonishment was the look on everyone’s face. Finally after watching this over and over Jack walked over to answer the questions. Who did this? And why? One guy said it was suicidal to have a LS3 engine in a 2900 pound car. He may be right but the show we saw was worth every penny. Finally, Jack reached in and turned the key. Instantly the car was alive and rumbling. It sounded like a very mad lion stuck in a very small cage. The rumble turns more heads. Small crowds developed around this car and its owner. The questions were flying from all corners. The funniest question I heard was this. Is it fast? Duh. The car is a small missile to say the least. With its race inspired tires the car is stuck to the pavement. Yes, it is small in there and yes the hard top does not fit in the trunk. But, for us fast muscle car people it is awe inspiring. Everyone, including myself was star struck. We know hot rods are Mustangs, Camaro’s, Chargers and so on. But to drop that monster engine in a Pontiac Solstice is another. It is the sleeper of all sleeper cars. Imagine pulling up to the light and looking over and down at a older guy in a Solstice. You would never imagine what was about to happen when the light dropped to green. I have seen car several other times this year at car shows and the response is the same everywhere. It is such an unassuming car and always gets passed over. That is until someone takes the time to look under the shell. Then, its game on. I guess the point of the story is to not judge anything or anyone at first glance. We all have seen resto mod cars and understand the crate engine business as it is today. But, be aware my fellow fast muscle car friends there is an evil out there you don’t know about. An evil that will rock everything you thought about a fast muscle car. 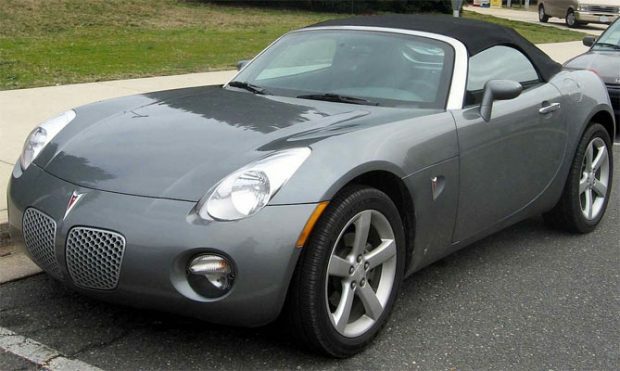 Related ItemsCan A Pontiac Solstice Be A Hot Rod?